Miller & Rhoads Department Store hired former Hollywood stunt man Bill Strother to fill Santa’s big red suit in 1942. Strother brought with him many techniques from Hollywood and made the Miller & Rhoads Santa Claus a symbol of the Christmas season. His makeup, designed by the famous Max Factor, took Strother about two hours to put on, and he was, without a doubt, the most realistic Santa Claus ever seen. In addition, he devised a special Santa act. After appearing out of a chimney, he received children on his lap and by use of a concealed throat-mike on an assistant, was able to address each child by name. No act at any theater in Richmond ever drew the crowds, adults as well as children that flocked to see this Santa Claus appear out of a chimney. 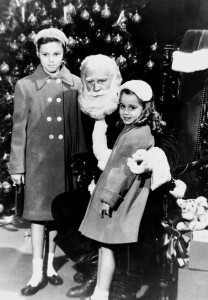 Bill Strother not only became the most famous Santa Claus in the history of Virginia, he was also the world’s highest paid Santa Claus according to an article in the Saturday Evening Post in 1951.